Laurence Borden: Rob, welcome to Dagogo. Before we get into the specifics of your products, let’s start with some basics. For the sake of simplicity, let’s assume that we have music on a computer’s hard drive (either ripped from CDs, or down-loaded). What computer software do we need to play music? Rob Robinson: It depends somewhat on the operating system. Let’s focus on the Mac OS. At the most basic level, the “Preview” function of the OS at the desktop level will play individual music files. That’s tedious, unless you only have a few music tracks. Instead, to be really useful one needs a way to organize a music collection or music library to make it convenient to find the music one wants to play. That’s one of the primary functions of iTunes. Third party player software is generally designed to provide functionality not included in iTunes, such as automatic sample rate selection plus other features important to audio enthusiasts who expect and embrace the highest quality music playback. LB: When you first became involved in computer audio, what software was available for that could be used for a music library and music playback? What did you perceive as their shortcomings? RR: When I first became involved in “computer audio” around 1989, the only software available was for recording: Sound Tools (which later became Pro Tools) by Digidesign. That was the only game in town, and it was still quite some time before it was possible to “rip” a CD to a hard drive. Back in the day, it just wasn’t practical to store useful amounts of digitally recorded music. At the turn of the century, the largest “reasonably priced” hard drives were only around 40 GB, or less than 80 uncompressed CDs worth of music. Lossy compression (MPEG-1 Layer 3, or MP3) was the key, which improved that by a factor of 10 or more. This made this avenue more attractive to music enthusiasts. But the only argument for “computer audio” at that time was one of convenience; the lossy compression always gave up ground to “straight” playback with a CD transport. But not so much to make lossy playback worthless. Lossy compression doesn’t blindly shed audio information. Instead, lossy compression was based on the clever application of psychoacoustic principles. The result was not ideal, but certainly more than listenable. The “Dolby Digital” audio on DVDs uses lossy compression, for example (except for the new “TrueHD,” which uses lossless compression). The whole thing was a lot of fun to play around with, and by the time lossless compression was available I had already added about 6,000 tracks from my CD collection to a hard disk music library, in lossy (though high bit rate) format (80 GB hard drives were a viable option by then). CD-ROM drives were slower than today so even incorporating this many tracks was a time consuming endeavor. Even so, I did this just for fun; for careful listening sessions I still went back to the original CDs. That is, until the combination of Apple Lossless compression (FLAC being somewhat impractical on the Mac platform) and larger hard drives arrived around 2004 – 2005. By then we also had a couple of DACs capable of 192 kHz 24 bit playback (in 2000, we already had a very nice 24/96 DAC available for R&D “computer audio” use) and we were moving along with the development of our nascent Pure Vinyl product. LB: Let’s turn now to your product, Pure Music (“pM”). When did you begin its development? Was it your intention to market it, or was it just for your personal use? And please tell us a bit about your background. RR: Pure Music actually is an offshoot of a Channel D “skunk works” project that originated in 2003 that became Pure Vinyl, so to talk about the development of Pure Music requires saying something about Pure Vinyl. Recall that in 2003 vinyl was at or near its nadir, a penny stock compared to the (relative) blue chip status of CDs in the music business at the time. Vinyl was essentially dead. So, this endeavor was pretty risky from a strictly business standpoint, but the potential gains for the remaining vinylphiles were pretty significant. Pure Vinyl was released in mid-2006, and we also know now that this time approximately marked the beginning of the resurgence of vinyl. I will talk in more detail about Pure Vinyl later, but suffice to say that in early 2008 we recognized that it was possible to link it to iTunes and use the music playback “engine” of Pure Vinyl as the “player” while iTunes was the “jukebox,” or library manager: A track selected in iTunes could be played within Pure Vinyl instead. Later that year we were approached by a small company marketing a “turnkey” one-box music server / computer, to develop a custom application for their server. We declined because we were too busy with Pure Vinyl and finishing our phono stages. About 6 months later that same company announced the launch of a music player software product that was created for use with their turnkey music server. That player software became a well-known audiophile music player application. Simultaneously, we recognized the need to improve the level of integration with iTunes, after learning that folks were buying Pure Vinyl just for the music player capability! I hated thinking of people spending too much money on Pure Vinyl, since they weren’t even using the recording and editing features, so a few months later we introduced Pure Music 1.0. Through something called “conditional compilation” Pure Vinyl could be stripped of the recording and editing features, resulting in Pure Music. This actually turned out nicely because improvements in the shared code base are automatically incorporated into both products. My background: I was an audio enthusiast as a teenager, and since then have owned well over a dozen turntables and countless loudspeaker systems and amplifiers. I also tinkered around with electronics as a youngster, experimenting with electronic projects. As everyone with such interests did in those days, I assembled many Heathkit projects and subscribed to Popular Electronics magazine. I became interested in subwoofers after seeing a Dahlquist subwoofer at a local audio shop, so I bought one of the Dahlquist passive crossovers and designed and built a subwoofer to use with it (a folded quarter wave labyrinth). This was but the first of many subwoofer designs, and I built and sold systems to fellow students (and even to one of my professors), and later colleagues at work (though I can’t recall how they learned of my affinity for audio). As an aside, sometime in the middle of all this I took up motocross racing and was lucky to be sponsored by a shop on a KTM machine, ultimately winning if not placing in the top three in the “A” (expert) class wherever I raced, and so managed to make extra cash (which was poured into my audio and photography hobbies), have fun, and stay in shape. I still enjoy riding a bike (and yearn for my racing days). I may yet do it again (if I can only find the time). I mention this to show that I seem to have a natural competitive bent, and that carries over into the design of my company’s products. I am an amateur musician. I began formal classical guitar and piano instruction while in college, and later played keyboards and guitar in a number of (rock) bands during and after grad school. That was a lot of fun, and dissipated the stresses of grad school. My later R&D career was more taxing time-wise (though even more fun), so sadly I had less time to devote to playing; consequently my playing chops aren’t anything like what they used to be. Fortunately, we recorded an album (which received over a dozen favorable reviews in various underground and semi-mainstream publications) so I still have something to show for it. As far as education goes, my advanced degree is in the subject of electrochemistry. During my undergraduate years, grad school and in my later R&D career at Bell Communications Research (originally part of AT&T Bell Labs) I improved my proficiency in electronic design and computer programming. Even as a chemistry undergraduate in the “mainframe” 1970s, students were expected to learn computer programming in support of the classroom work; if you didn’t already know programming you had to either learn it quickly or take the requisite courses (and fall behind). In those days that meant stacks of punched cards carried around in a box and late nights at the campus computer center. There is very little work done with “test tubes and flasks” in electrochemistry, but quite a lot of electronic design and programming. All of this stuff had to be designed and built from scratch, there were no off-the-shelf products that did what I needed for my work. To assist in my battery / electrochemistry research, I designed and built an electrochemical scanning tunneling microscope, which was one of just a few such instruments in the world, if not the very first one (it was a bit of a race involving 60 – 70 hour work weeks; once, I completed an experiment just a few hours before leaving for Japan to present the results at a technical conference. Whew). In the lab, having all of the associated test gear available (digital scopes, spectrum analyzers, frequency counters) was invaluable when it came to feeding my audio hobby in my free time. All of the experience gained working in that R&D environment, though not specific training or formal education in audio engineering per se, eventually came to bear; for example, practical experience in the design of low noise, high speed electronics facilitated our hardware product offerings. Having this perspective of both the software and hardware end of things (plus electrochemistry and expertise in battery technology, in terms of designing the low impedance AGM power supply used for the Seta phono stage) has proven uniquely valuable when it came to creating cutting-edge products. LB: Is pM geared for sophisticated computer operators, or is it novice-friendly? RR: I reckon that it must be novice – friendly, because we have many users who not only say they are using their first Macintosh computer, but their first computer, period. It’s intended to be accessible to music lovers who know little or nothing about computers. When you come down to it, I think that using a computer today is less complicated or technologically “threatening” than even using a VCR (and I hated using a VCR). For starters, the computer sets its clock automatically; no more flashing 12:00 after a power failure! And the folks at an Apple store often will fall over themselves in helping a first time computer user to get up and running. But as with anything new, there are a few tidbits of knowledge that might need to be picked up. You can’t read French poetry without first learning French, and if you are new to computers, there will be a few things to learn (though much easier than learning French). Look on it as an enriching experience ahead, not an obstacle. LB: If I understand correctly, pM works in conjunction with iTunes, rather than replacing it entirely? Why did you take that approach? But implementing the iTunes integration wasn’t a simple walk in the park, either. It took a lot of effort developing the communication routines (but using standard, Apple-provided APIs) in terms of juggling and fine-tuning the priorities of the different types of messages sent to and received from iTunes, while keeping the processing overhead low and the player responsive to user input. The net result is that iTunes is out of the way when Pure Music is playing music, with iTunes only taking a small fraction of one percent of CPU time. And if that’s cause for concern, there is Pure Music’s Less is More mode where the communication between Pure Music and iTunes is completely severed during music playback, and iTunes’ CPU footprint is effectively zero, because it isn’t engaged in any activity during playback (only when picking a track). What also enhanced this conjunction was creating a unique (patent pending) way of permitting “foreign” file types such as FLAC and DSD to be displayed and used in iTunes, the same as other typical iTunes-supported formats such as AIFF, WAV and ALAC. In a playlist configured to show sample rate along with other track information, it’s cause for a double take to see a playlist with a DSD audio track with a sample rate of 2822.4 kHz displayed beside a 44.1 kHz CD format track! LB: Without giving away any trade secrets, what are some of the factors that you found to be important in the software for optimizing sound quality? Were these apparent from the get-go, or did you discover them as pM was being developed? RR: This is part of our IP “sweat equity” that came about as a result of understanding best programming practices for smooth data throughput and instruction execution, developed over 27 years of experience writing software for the Apple Macintosh platform. This included writing driver level code to support custom hardware for signal acquisition and control of specialized laboratory instrumentation (during my research career). That experience was rewarding because developing driver level code requires you to carefully contemplate the effect of any and all small changes you might make. The timing of instruction execution and data transfers is especially critical to driver level code. If you are designing a word processor or database application, those factors doesn’t matter much, if at all. But real-time processing such as audio playback is a different matter. It’s a bit like designing a boat hull to carve through the water with the minimum of turbulence and drag. A small design change can cause an unexpected result (usually for the worse). Driver-level code has to run fast and smooth, and the same design principles apply to any real-time programming task such as audio player software (and video analysis; one of the first Channel D software products was designed for video motion detection and motion tracking). We want to create the minimum amount of “turbulence” (for example in the form of spikes in CPU usage) during the time when music is being played, parceling tasks to the CPU as smoothly as possible. As one example, computer power draw fluctuates with CPU usage, and these fluctuations can pollute power supply ground references, contributing to digital jitter. A steady-state, “non-turbulent” design circumvents this problem, and understanding driver design gives the insight needed for player software that uses the CPU and computer resources as smoothly and efficiently as possible. There are of course more mundane but still important factors, like the dithered volume control and real-time upsampling. The upsampling, in particular, uses 64 bit filter coefficients for the essential reconstruction filters (which we designed from scratch and painstakingly optimized over the course of several years). If anyone has tried hardware upsampling and disliked it, software is different. Software has the unfair advantage of the availability of 64 bit precision. The goal of upsampling is simply to change the sample rate, without adding coloration or distortion, and this is only truly possible with 64 bit precision, such as used in Pure Music. DSP hardware for upsampling is typically limited to 32 bits, or at best 48 bits. There are measurements of our sample rate converter / upsampler posted on our website, and it is the equal of anything else available, whether real time or offline. The theoretical limit of the performance is dictated by the quality of the algorithm and reconstruction filters plus the math precision. The best sample rate converters, including ours, achieve it. LB: Many computer audiophiles maintain that music playback can be improved by modifying the hardware and /or software; examples, include the use of solid state drives rather than spinning hard drives; modified power supplies including those that use batteries; anti-vibration devices; and turning off all unnecessary software, etc., to name a few. Please share with us your thoughts and experiences, on this topic, and how (if at all) it influenced the development of pM. RR: I can’t speak for the effectiveness of all of these various things in terms of their influence on music playback quality. Some of it isn’t as simple as it seems. For example one can replace the computer power “brick” supply with a battery supply, but what about the other switching regulators inside the computer? A solid state drive (SSD) is easier to rationalize: The lower power usage and faster responsiveness are beneficial. Disabling OS features at a low level may possibly provide short term benefits, but I think this is asking for trouble, because you risk creating a Frankenstein system that is not maintainable or reliable in the long run. Sure, adding a supercharger or nitrous injection to a car engine increases the performance but at the price of increased maintenance and operating cost. And when it breaks down, the performance is effectively zero. Such things are impractical unless one has the time and patience to be one’s own full time “mechanic.” I prefer keeping things as “vanilla” as possible except for those easy upgrades that deliver tangible performance improvements, like more memory, a larger hard drive, and an SSD; plus a few specific settings made in the computer OS preferences (covered in our product documentation). LB: Please tell us about some of the specific features of pM that contribute to its ease of use. RR: Well, what you are really asking is: How easy is it to use iTunes and the Remote App? Most other important features in Pure Music are already active by default; with the exception that the user should activate Memory Play and Upsampling (if desired). The settings are preserved across launches, of course. In some ways it is easier to use than iTunes (automatic sample rate switching compared to doing it manually). The many other features in Pure Music are only needed to further customize the behavior of the software, or preferences in the way audio is handled (volume control, optional plug-ins or the multi-way crossover) or displayed (metering).They can be ignored if one is concerned about complexity. LB: If I understand correctly, pM works with Mac computers, but not PCs. Was your choice guided by Macs’ more intuitive operating system, or did you feel that Macs had the potential to provide better sonics? RR: There are way too many variables to make a general statement about the “sonic” quality of one platform vs. the other, and it would be a moving target anyway because the product offerings (hardware and OS) are always changing. It’s almost like asking who makes the best cameras, Canon or Nikon (or insert name of your favorite manufacturer). At a given point in time one of those manufacturer’s top products may have advantages over the other but at the current pace of innovation any advantages are only buttressed by shifting sand. There are more differences between the sound of different DACs than between different computers; even so, it is pretty hard to find a “bad” sounding DAC nowadays. So I think it comes down to what is easiest to use, and what works most reliably? If you enjoy tweaking a computer OS and maintaining all of the changes you have made, fixing things that might be undone by OS updates, etc. there can be some satisfaction in that activity, but I think most music lovers would eventually find that exercise distracting when the goal is to just sit down, relax and listen to music. This is supposed to be a fun hobby, after all, and I think the fun of listening to music is more important than the “fun” of tweaking and messing with a computer. That is where the Mac OS comes in; there’s less focus on the computer, and more on the music. LB: One very desirable feature of computer audio is the ability access all the music from the comfort of one’s listening chair. Can pM be controlled remotely? RR: Sure, by using the standard Apple Remote App. LB: Can pM be used in a multi-room system? RR: Yes. That functionality is built-in in two ways. First, one may use a DAC with more than two output channels and physically hardwire the outputs (line level balanced audio cable) to different zones. Second, Pure Music’s NetSend feature permits streaming the audio to up to four separate computer systems, each with its own DAC, via Ethernet. In principle, this is the same as the first way except we are using a computer network to transfer the audio instead of analog wiring, and there is more flexibility in configuring the system. The foregoing aren’t limited to 44.1 or 48 kHz 16 bit audio, as are wireless systems based on something like Airport Express. Both support resolutions up to the maximum DAC word length and sample rate (384 kHz 24 bit or the limit of the DAC). And there is the added benefit which comes from being able to time align the separate zones, as I will explain. With either method, the relative levels of the zones can be controlled independently, and a time-alignment delay can be specified for different zones. This turns out to be a very useful feature. For example let’s say the main system has a wide-range output with subwoofers and can be heard throughout the living space, in multiple rooms. Secondary audio or speaker systems set up in other rooms provide reinforcement; otherwise the main system might have to be played too loudly to get an acceptable listening volume at the spot farthest from the main one. The problem is that the different sound sources aren’t time-aligned, creating an echoey mess. But by time aligning the distant system(s) with the primary (and in the process, automatically time aligning all of the systems) there results a nice “coherence” to the audio as one moves around in the living space, and the playback volume can be controlled as appropriate in each zone. LB: High-resolution music is becoming increasingly popular. What are pM’s limitations in terms of word length and bit rate? RR: As far as high fidelity formats go, there are no limitations (and this includes support for 2.8 and 5.6 megahertz, 1 bit DSD). LB: As new versions of pM become available, is there a mechanism for customers to easily upgrade? Similarly, how is pM affected when new Mac operating systems are released? RR: So far (almost two years), all upgrades have been free. There is a notification mechanism for updates, then it’s just a matter of downloading the new software and replacing the older version. Pure Vinyl updates have been free since it was introduced in 2006. Pure Music (and Pure Vinyl) have not been affected at all by the introduction of new OS or iTunes versions. That includes iTunes versions all the way back to iTunes 7. Technically, there was one tiny change due to a change in the behavior of a particular API in Lion, involving two lines of code, and this involved a minor feature of Pure Music anyway; regardless, we had posted an update within 24 hours of Lion’s release. I think that longevity says a lot about the development skills and experience that’s resulted from our long term experience with the Mac platform, and our philosophy of not making risky programming decisions for the sake of putative or hurried improvements. Basically, we try to do everything “by the book” with approved Apple APIs without using undocumented OS features or “hacks” that can cause software to break from OS updates. Over the years, we have seen other software products broken and lying in the dust for not observing this simple but inelastic principle. It’s easier and faster to work around the “rules” by taking programming short-cuts, but not if you want to be in the game a long time. LB: Let’s turn now to another of your products, Pure Vinyl (“pV”), which you alluded to earlier as being the predecessor to Pure Music. If I understand correctly, this software allows one to archive vinyl recordings to a computer, but it also serves an alternative means to listen to records. Was your main intent to provide a means to archive vinyl recordings to computer, or to make a better-sounding playback system for vinyl? RR: I consider myself a dedicated vinyl and analog enthusiast, and would not consider digital for serious listening if it meant compromising the playback quality. I mean, I don’t even own an iPod (but I bought a Walkman when they first were introduced). When “computer audio” (as it was) first became available, I carefully scrutinized the sound quality of the digital hardware available then before incorporating it into my playback system, first using a 96/24 pro audio interface as a DAC for a CD transport, and running some custom code on a Mac for the subwoofer crossover. User friendly? Forget it. Pure Vinyl was only created to make a better-sounding playback system for vinyl. The initial prototypes of the software (long before we even considered marketing it) for archiving were quite cumbersome, so archiving wasn’t even the primary goal. But one advantage of archiving is a reduction of wear and tear on the playback hardware, especially expensive playback styli. I hate setting up a cartridge. I have to plan ahead to make sure I have no interruptions on that day, because it can take me a couple of hours to get it just right (I use a microscope to check alignment). I’m sure there are folks who do this more frequently and consequently much more quickly, but that isn’t me, or most other people, I think. So the archiving feature of Pure Vinyl was seen as a way to “play it again” while forestalling the inevitable stylus / cartridge replacement cycle, without concern about missing out on the best possible playback quality. 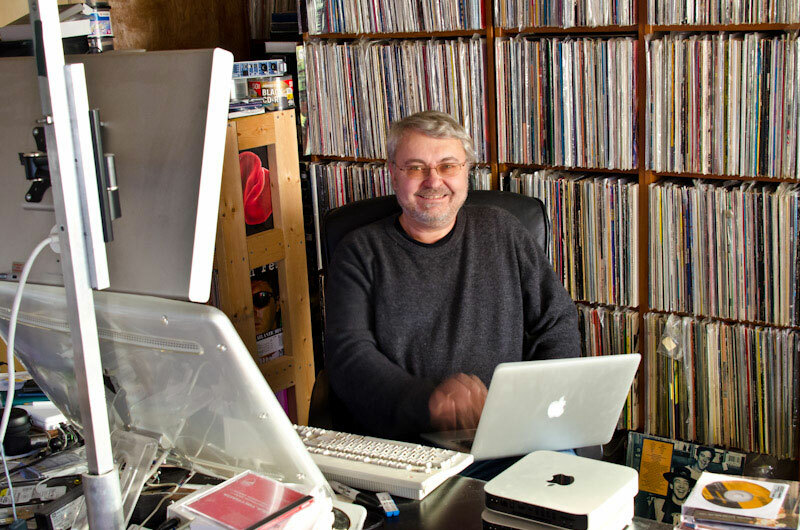 LB: Many vinylphiles – myself included – shudder at the thought of digitizing analogue recordings. I was thus rather shocked at how good – and non-digital – the music sounded in your room at a recent audio show. Quite frankly, I would not have thought this possible had I not heard it with my own two ears. Please tell us in basic terms how pV works, and -without giving away any trade secrets – how you were able to achieve such high fidelity. RR: There are no secrets to the principles involved, but as usually happens the effectiveness is linked with the quality and the execution of the design. Honestly, I was rather shocked myself the first time I auditioned the proof-of-concept design around 2003, which just consisted of the kernel of the RIAA correction, only optimized for one sample rate plus a very simple IC based differential gain stage for the signal from the turntable. That result spurred the further development of the product. The technical reasons why it works as well as it does are detailed in a paper I presented at the 123rd AES convention in 2007 (the paper is downloadable from our website). Briefly, the RIAA compensation filter is a low pass filter, analogous to the reconstruction filter used for playing DSD audio. In DSD, 1 bit audio becomes 24 bit audio at a lower sample rate. Likewise, the RIAA emphasis is used to advantage in the digital domain because the filtering actually increases the digital resolution in the treble. This also reduces any high frequency distortion contributed by the analog to digital converter (ADC). None of this is possible if the analog to digital conversion is performed post-RIAA correction; that is, with a conventional phono stage. Think of performing the analog to digital conversion step “pre-RIAA” as conferring the significant advantage of allowing the RIAA emphasis to “reach” farther down the signal playback pipeline, hanging on to it as long as possible before applying the compensation filter. I should mention that performing this correction in computer software will always have an advantage over doing the same thing with DSP hardware, because software can use 64 bit floating point math, whereas DSP hardware is typically limited to 32 bit floating point (a few DSP chips have up to 48 bit floating point available for filtering). This is the same argument that can be applied to upsampling. Having 64 bit data in the pipeline also is advantageous when it comes to further processing, such as incorporating a rumble filter or subwoofer / multi-way crossover. With 64 bit resolution, there is essentially no added noise or distortion. Furthermore, it would be impossible if not extremely impractical to attain the same level of performance in the analog domain. LB: Once a record is digitized via an A-to-D converter, and stored on a hard drive, is there a reason to ever spin the record again? That is, will the stored version sound as good as when digitized on the fly? RR: The goal is for the original vinyl playback, the stored transferred version and the live vinyl playback with RIAA correction performed in software on the fly to be indistinguishable from each other. On that basis, there would be no reason to take out the original disc again. But if one upgrades to “better” components: tonearm, cartridge, ADC – you have bought a new record collection with the upgrade, and there is a reason to spin the record again. However this doesn’t mean that any previous effort in making digital transfers was for naught. First, “better” when it comes to high end audio is a loaded proposition. There are usually trade-offs, and this is particularly true when it comes to vinyl. Two different $5,000 cartridges or tonearms will have their strengths and weaknesses, and one would be hard pressed to say one or the other was definitely “better.” I still listen to and enjoy the vinyl recordings I made in 2006 using a relatively modest (by high end standards) playback setup consisting of a Michell turntable and Ortofon Kontrapunkt b moving coil cartridge (compared to our current reference setup, worth 10 times as much), and don’t necessarily feel disposed to re-record them. Of course, if I were to play a vinyl disc again with upgraded components, I also would record it again. One benefit includes having a nice and easy way to directly compare playback components simply by comparing the high resolution transfers. Accordingly, one could build up a small library of reference recordings to compare different cartridges, tonearms, ADCs, preamplifiers, etc. Comparing different components might otherwise be impossible (discontinued cartridges, having to precisely replicate a tonearm / cartridge setup, etc.) or somewhat cumbersome (think of a dealer setting up a turntable in a client’s home for an audition). To that end, such recordings could be played in other persons’ systems as an easy way of “virtually” auditioning a vinyl playback setup in conjunction with the other components, and in a fully reproducible way. LB: Does pV have a mechanism to reduce or eliminate crack and pops? Does it have any other special features? RR: There is a “surgical” pop and click removal feature, which can be used to excise the occasional pop (a well cared for vinyl record should have very few of these). Of course, removing pops and clicks is a lot easier when one has the pre-RIAA signal available. With a fast moving coil cartridge and flat, wide bandwidth phono amplifier, some pops are only a couple samples long, even at a 192 kHz sample rate. These are easily excised without audible impact. That’s not true after passing such pops through an RIAA filter, which stretches the pops considerably. So now you have to address 10 or 20 polluted samples instead of only 1 or 2, a much more difficult proposition. Other special features? There is a signal level trigger feature that starts a recording when the stylus drop is detected, and pauses (and locks the pause) upon stylus lift. That feature alone goes a long way towards making it a joy to use for transferring vinyl to high resolution digital. Certainly easier than the old days with a cassette deck. If one has an ADC with more than two input channels, one may connect additional analog sources (tuner, tape deck, etc.) to the unused inputs, and Pure Vinyl becomes a “virtual” line-level switching preamplifier. After assigning track cue points, one has two options for proceeding. On the one hand, one may “render” individual tracks from the “master” recording, producing portable music files (with the RIAA correction applied) which can be at the original resolution, or sample rate converted (downsampled) for burning to a CD-R or copying to a portable device such as an iPad. Pure Vinyl has a built-in sample rate converter for this purpose. On the other hand, there is a “create bookmark” feature that instead of making separate physical copies of the tracks, just puts track markers into iTunes that point to the tracks assigned to the master vinyl recording. This is similar to the mechanism Pure Music uses for adding FLAC or DSD files to iTunes playlists, and is also the subject of a patent application. When such a track (which also can be organized in playlists, shuffled, etc.) is played in iTunes, Pure Vinyl / Pure Music recognizes it as a “vinyl” track and fetches the corresponding portion of the master recording into memory for playback (automatically applying the RIAA correction, as well). This neat trick avoids having to waste hard disk space to produce physical copies of high resolution tracks from the LP album for playback. Last but not least, there is our unique and patented “virtual vinyl” cue guide image feature: a replica of a vinyl disc generated from the audio in the recording. This makes it easier to split the recording into individual tracks by using the familiar vinyl paradigm, same as cueing up a track on an LP record. Seeing this working for the first time was the thing that really clinched the decision to release the product. Sure, the sound quality benefits of the software RIAA compensation merit primary consideration, but we wanted something to visually distinguish the product. Even 5 years after its first public demonstrations at Rocky Mountain Audio Fest in 2006, we still get “oohs” and “ahhs” from people seeing it for the first time. I doubt that software that merely performed RIAA correction (though that’s a key feature) would have quite the same cachet. LB: Many of us are far more familiar with D-to-A converters than with A-to-D converters. Does pV contain its own A-to-D converter? If not, are there any particular models you recommend? RR: Well, Pure Vinyl is software, and an ADC (analog to digital converter) is hardware, two distinctly different things. But an ADC is essential to get an analog signal “into” the computer. Designing and manufacturing a competitive, high performance ADC requires a great deal of resources and such resources can be found in the pro-audio industry, which manufactures a plethora of such products. The choice of ADC basically comes down to budget, with more expensive models providing lower distortion and noise. It is possible to do quite well for less than $400, and such products are one of the best bargains in audio today. Higher end models retail for more than ten times that amount (and we have many of these models in our testing inventory). There are examples shown on our website at www.getting-started-with-computer-audio.com. The easiest ADC products to use incorporate a DAC in the same box, or else provide a separate digital audio or clock connection that can be used to synchronize with a separate DAC, if you already have a favorite DAC in your system. Some audiophile – oriented companies are beginning to introduce their own ADCs, but unless you buy a unit that incorporates a sample clock input or output connection, and have a similar connection available on your DAC, it can be tricky to connect everything together so that it functions properly. We can assist in choosing a product that complements the components a user might already have, and make sure everything will work together. LB: You also sell a phono preamplifer, the SETA. How does it work in conjunction with pV? RR: We were evaluating ways of getting the “flat” (non-RIAA compensated) signal from the vinyl to the ADC at the highest possible quality. An economical yet very high quality way of doing this is to simply use the preamplifiers built in to most pro-audio “audio interfaces” (ADC / DACs). There are a few minor obstacles, namely proper loading of the phono cartridge and connector compatibility (RCA vs. XLR or TRS). We address this by selling a line of customized, inexpensive adapters that incorporate the necessary loading and connectors. Next, recognizing that a possible bottleneck to quality might be the analog front end of the audio interface (considering the modest price point) we tried a high quality, well regarded professional microphone preamplifier (costing much more than the audio interface we were using). With this premium microphone preamplifier, there was a significant improvement in dynamics and definition, and ease of presentation. Well, one of the selling points of that preamplifier was wide signal bandwidth – about 500 kHz. I took a peek inside and was a little surprised to see that it was based on a common, monolithic integrated circuit microphone preamplifier chip (though well executed in overall design). That aroused my curiosity because I knew there might be room for improvement. Based on an hypothesis that the circuit bandwidth was a factor in the playback improvement, we endeavored to design a balanced (differential) preamplifier that greatly extended this bandwidth figure, and without using an integrated circuit preamplifier chip. The aim was not to compete with the other preamplifier, because if the results weren’t markedly better, with that very highly regarded preamplifier as a benchmark, there would be no point in producing a product. Well, the results using the first prototype were immediately apparent: more definition, and a more engaging presentation to the music. The music drew you in and made you forget about the equipment. The measured bandwidth of this design was over 5 megahertz (-3 dB). In retrospect the results of the listening tests should not have been very surprising, because the vinyl signal has pre-emphasized treble, which puts more stress on the amplifier in terms of audio reproduction, the treble region being where an audio amplifier is most vulnerable to harmonic, transient and intermodulation distortions. Besides, pops and clicks have a very fast rise time which in itself can cause trouble for a preamplifier. Many phono stages are designed for good signal to noise ratio and low distortion from 20 Hz to 20 kHz, and limit the bandwidth to that range. That is easier than designing a preamplifier with a DC to 5 MHz bandwidth, but I think we had the correct goals in mind when designing the Seta, and the payoff in sound quality was worth it. So one of the goals of developing the Seta was to provide a “flat” (non-RIAA) phono stage with the necessary gain plus adjustable cartridge loading and compatible connectors, and above all, top performance. Keep in mind that even with a modest preamplifier of the sort included with an ADC/DAC audio interface, the results (with software RIAA compensation) will be spectacular compared to a conventional (and that includes premium) phono stage. The Seta refines and enhances this further. Of course, the stiff reservoir of current provided by the quiet, low impedance AGM battery power supply (capable of delivering well over 20 amperes of current, which can’t be matched by simply adding storage capacitors) was an important aspect of the design, as well. By the way, Seta means silk in Italian, which I think accurately describes the sonic characteristics of the preamp. A funny thing regarding that name is that I am (as many of my friends know) an amateur mycologist, which gives my wife and I something to do during rainy times when we can’t go on a ride or to the shore (we are based in New Jersey, less than an hour’s drive from the beautiful Atlantic Ocean) and the wild mushrooms are popping up. Quite some time after the Seta was introduced, we learned that seta also is Spanish for mushroom! Strange and funny coincidence. LB: Please tell us a bit about your other products, Audio Leak (“aL”), Waavebox (“wB”), and Mac the Scope (“≈m”)? RR: AudioLeak is an audio equivalent loudness analyzer aimed at the pro audio and broadcast market. The free version, which can be downloaded from our website, also can be used by audiophiles to quickly gather loudness and peak level statistics (e.g., dynamic range) for audio tracks. Analysis of audio files happens at 100 times real-time or faster: almost instantly. Mac the Scope and Waavebox were Channel D’s first audio related products, released in the 1990s, and still marketed today. Mac the Scope is a signal analyzer and Waavebox a signal generator (e.g., sine, triangle, white, pink noise, sweeps, etc). Mac the Scope includes a very accurate 1/3 octave real-time analyzer, plus a swept sine analyzer that can be used to measure components (and listening rooms) with extremely high frequency and amplitude accuracy: 1/192 of an octave and 0.01 dB or better. This is great for finding low frequency room modes, which can be so narrow in bandwidth (high Q) as to be undetectable with an RTA. Such measurements would guide the correction of room low frequency response with a parametric EQ. We are in the process of revising Mac the Scope and Waavebox for support for the Lion OS, which no longer grandfathers PowerPC support via the Rosetta emulation feature of previous OS versions. But that is not so bad when one considers that Mac the Scope, released in 1997, remains a viable product from OS 7.5 through OS X 10.4, 10.5 and 10.6, or 14 years. Again, that we were able to continue to support the product with minimal revisions across different OS versions is, I think, a testament to sensible software engineering practices. LB: In closing, please share with us your thoughts and views on the future of computer audio, where you see it headed, and whether there are any new Channel D products on the horizon. RR: I think the future is now! We are living in the best of times for being an audiophile. All audiophiles should be jumping with joy! Not just in terms of computer audio, but in all aspects and product categories. Everything is fitting together and working better than ever before. Channel D has new products and upgrades in the pipeline but I can’t share details just yet. However there is one upcoming hardware product we showed in prototype form at the recent RMAF. It’s an active ultra wide bandwidth attenuator / high input impedance buffer for all DACs – regardless of the DAC. It uses much of the same technology developed for the Seta preamplifiers, including the stiff, low impedance low noise AGM power supply. It addresses a significant shortcoming we’ve seen in too many digital audio playback systems: incorrect system gain structure. Digital volume controls are useful and essentially transparent if used in moderation, say between 0 dB and -12 dB of attenuation (the rationale for this choice is explained on our website, on the web page referenced earlier under ADCs). However it almost makes me want to cry when I see someone with ultra high efficiency speakers using a digital volume control at -20 dB or below, because of having too much signal gain in the system. Such volume settings are for background music levels, not critical listening, and they are throwing away signal quality. The easy solution is to insert analog attenuation in between the DAC and power amplifier, so a higher digital volume setting can be used in the player software. However, some DAC output stages have trouble driving the relatively low impedance (1000 ohms or so) of typical passive analog attenuators, and consequently can take on an unpleasant hardness or glare. Enter the Seta Buffer (final product name pending). This is essentially a “minimalist,” single input, line level balanced (XLR inputs and outputs) preamplifier with switch selectable attenuation (no gain) in 6 dB steps from 0 to -30 dB, permitting setting the proper system gain structure. The output impedance is less than 20 ohms, so can drive any power amplifier, and the input impedance is 2 megohms, which easily can be driven by any DAC. It’s designed to provide a simpler, more stripped down signal path than the usual way of adjusting analog gain (line level preamplifier). The bandwidth is DC to 15 megahertz (-3 dB) and it is completely transparent sonically. In our RMAF demo of the Buffer we were using an inexpensive ($600) Apogee DAC that took on an unpleasant harshness when driving a passive analog attenuator. The alternative was 25 dB of digital attenuation, but the sound became soft and veiled. On the other hand, connected to the power amplifier via the Buffer, it compared respectably well in sound quality to the $12,000 DAC we also had on hand. The expensive DAC won out with better definition, but the Buffer clearly allowed the merits of the more modest DAC to bloom, leveling the playing field. The next step is refining the design in response to talking with folks at the expo, after getting feedback on what they might want in such a product. LB: Rob, on behalf of dagogo and our readers, I would like to thank you for taking the time to tell us about your fascinating products. We wish you continued success, and will keep a close eye on the Channel D product line. RR: Thank you, it has been my pleasure!